New in version 2.4: The data collector extension was introduced in Symfony 2.4. Change data from the request, before submitting the data to the form. The Symfony\Component\Form\Extension\Core\EventListener\ResizeFormListener subscribes to the FormEvents::SUBMIT event in order to remove the fields that need to be removed whenever manipulating a collection of forms for which allow_delete has been enabled. 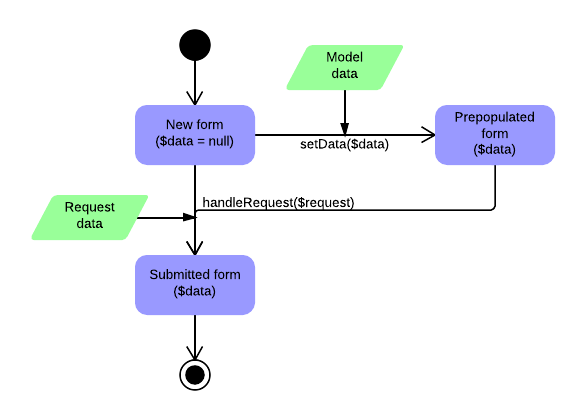 The Symfony\Component\Form\Extension\DataCollector\EventListener\DataCollectorListener subscribes to the FormEvents::POST_SUBMIT event in order to collect information about the forms. 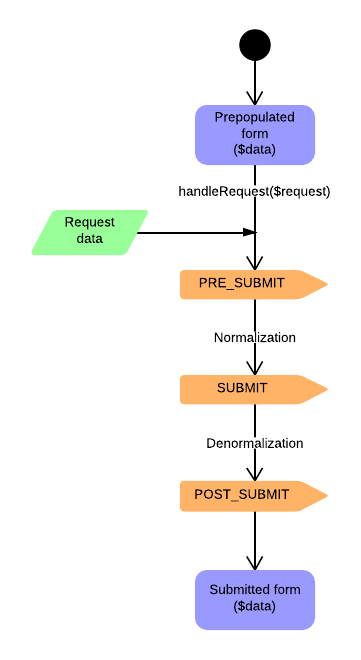 The Symfony\Component\Form\Extension\Validator\EventListener\ValidationListener subscribes to the FormEvents::POST_SUBMIT event in order to automatically validate the denormalized object, and update the normalized as well as the view's representations. In order to be able to use Form events, you need to create an event listener or an event subscriber, and register it to an event. The name of each of the "form" events is defined as a constant on the FormEvents class. Additionally, each event callback (listener or subscriber method) is passed a single argument, which is an instance of FormEvent. 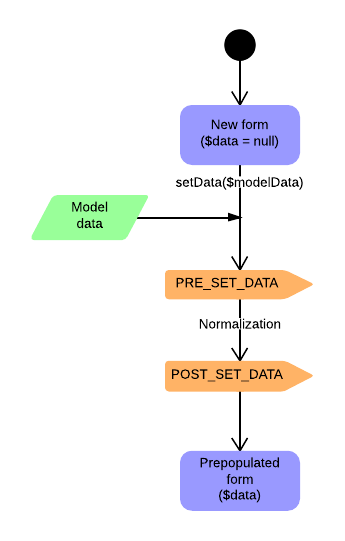 The event object contains a reference to the current state of the form, and the current data being processed. New in version 2.3: Before Symfony 2.3, FormEvents::PRE_SUBMIT, FormEvents::SUBMIT and FormEvents::POST_SUBMIT were called FormEvents::PRE_BIND, FormEvents::BIND and FormEvents::POST_BIND. The FormEvents::PRE_BIND, FormEvents::BIND and FormEvents::POST_BIND constants will be removed in version 3.0 of Symfony. The event names still keep their original values, so make sure you use the FormEvents constants in your code for forward compatibility.